There’s vegan soul food we pretend taste good. Then, there’s vegan soul food that actually does taste good, because it’s cooked with soul…from the earth… from the heart. That’s Bryant Terry vegan soul food philosophy. In his ten years of being a food activist, he’s written a few books: Grub: Ideas for an Urban Organic Kitchen written with Anna Lappé, Vegan Soul Kitchen: Fresh, Healthy, and Creative African-American Cuisine, contributed to A Taste of Life: 1,000 Vegetarian Recipes from Around the World and more. He’s essential to the movement of returning soul food back to its healthy roots. His cooking lessons started in his grandparents’ garden in Memphis, Tennessee. Today he is a fellow of the Food and Society Policy Fellows Program, a national project of the W.K. Kellogg Foundation. His latest book, The Inspired Vegan, publishes January 2012. It’s a cookbook marking his ten years of inspiring people to return to their soulful roots and cook from their heart as well. Pre-order the The Inspired Vegan on Amazon to learn what influences Terry’s creativity in the kitchen and learn more exciting cooking techniques and recipes. Also, follow him on Facebook/TheInspiredVegan, Twitter @BryantTerry and visit his website at Bryant-Terry.com. Meanwhile, read below to learn how Kwanzaa influences Terry’s food activism and learn how to win an autograph copy of his upcoming new book, The Inspired Vegan. Do you celebrate Kwanzaa with your family? If so, what are your plans this year? I started celebrating Kwanzaa in college, and I continued to do so a few years after graduating. But I have not celebrated the holiday in recent years. Last week, in preparation for a talk celebrating Kwanzaa at the University of Illinois Urbana-Champaign, I did a lot of research on the holiday, so it was a daily topic in our home (I encourage readers to watch the documentary film The Black Candle by MK Asante). My wife and I decided to make it a family tradition starting this December, since we have a newborn daughter. 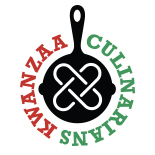 Under the Kwanzaa principle, Kujichagulia, you have shared your passion and knowledge about food with low-income communities, particularly of color. Reflecting on your work, what is your proudest moment of achievement? So often, people imagine vegetarianism and veganism as “white” diets. In the spirit of Kujichagulia, I hope that my body of work moves people of African descent to reclaim the pre-colonial, pre-industrial plant-based origins of many of our diets. That being said, for the first year of Vegan Soul Kitchen’s publication, I would get over a dozen messages every week from folks who identified as Black stating that they are not vegetarians or vegans, and they thoroughly enjoyed the recipes in the book. Those messages made me feel more proud of that book-project than anything else. As a cookbook author, you’re one of the pioneers bring Soul Food back to its original healthy roots. What is a continued challenge about the misconception of Soul Food being unhealthy? One of the biggest challenges of my work is helping African-Americans recognize the diversity and complexity of our cultural cuisine. When most people talk about “Soul Food” they are referring to the comfort foods of the cuisine—the foods that my family ate on holidays and celebrations. Don’t get me wrong, while comfort foods like fried chicken, red velvet cake, and macaroni and cheese tend to hog all the attention in the popular imagination, I certainly don’t think we should discard or ignore the fatty-sugary foods of African American cuisine. I like to indulge every once in a while just as much as the next person. I simply want to challenge people to move beyond obvious ingredients and dishes and discover the hidden narrative of African American cooking. I want us all to learn more about the diverse ingredients, regional variations, and modern interpretations. Recognize its complexity. What is the basic philosophy/message behind your upcoming book, The Inspired Vegan? Because most people are so disconnected from having pleasurable experiences with wholesome, fresh food, I see empowering them to cook at home and share meals with family and friends as a revolutionary first step towards food justice. We can talk about local, seasonal, and sustainable for days, but if people don’t feel connected to this type of food why would they fight for it? In my mind, building community around the table and strengthening the food justice movement must go hand in hand. When you consider that educating, strategizing, and organizing for many social movements throughout the 20th century happened in people’s homes, it seems appropriate that the food revolution will find its spark in home kitchens. Can you share a recipe from The Inspired Vegan that is reflective of Kujichagulia (or Kwanzaa)? Molasses, Miso and Maple-Candied Yams recipe from the “Detroit Harvest” menu in The Inspired Vegan. Candied Sweet Potatoes is a popular side dish often served on holidays in the South. This everyday version makes use of two staples of Japanese cooking—tamari (wheat-free soy sauce) and Miso (fermented soy bean paste)—to give this recipe an Asian twist. Sesame oil seals the deal. One might imagine the taste of these strong ingredients overpowering the combination of cinnamon, sugar, molasses, and maple. But the complex, multi-layered flavors coexist harmoniously and yield a perfect balance of sweet and savory. The sweet potatoes are roasted first to caramelize their exterior and bring out their inherent earthy sweetness. Next the liquid is used to baste the sweet potatoes for over half an hour to ensure that they are moist. Result: Slammin’. 2. In a large bowl, toss the yams with 1 tablespoon of the sesame oil. 3. Spread the sweet potatoes on a parchment-lined or well-greased baking sheet in a single layer and roast for 50 minutes, turning over with a fork after 25 minutes. 4. Remove the sweet potatoes from the oven and reduce the heat to 375°F. 5. Place the cinnamon stick at the bottom of a 2-quart baking dish, and add the sweet potatoes in layers. Set aside. 6. In a medium bowl, whisk together the, molasses, tamari, maple syrup, miso, orange juice, lemon juice, lemon zest, water, and the remaining tablespoon of sesame oil. Pour over the sweet potatoes. 7. Bake uncovered, for 30 minutes, thoroughly basting the sweet potatoes every 10 minutes. CONTEST: Which Kwanzaa Principle Inspires You to Eat Healthy? Leave a comment below with a personal story about a Kwanzaa principle that inspires you to eat healthy. One random winner selected by Bryant Terry wins an autograph copy of his upcoming new book, The Inspired Vegan, published in January 2012. Contest starts Tues., Dec. 6, 2011 and ends Wed., Dec. 21 at 11 p.m./EST. Winner announced on Tues., Dec. 27th. Contest open to residents of the continental United States, excluding Alaska, Hawaii and U.S. foreign territories. No additional purchase or shipping expenses are necessary. Prize cannot be exchanged. Must provide an email used only to notify the winner and for shipping information. Kujichagulia is my favourite principal. So I would use this to inspire ne and others to eat healthily. I can also see how a number of the other principles would also be inspirational. My principle would be Kuumba — creativity. I made a conscious decision to eat better and include more vegan foods in my diet after having 8 fibroids removed from my uterus. I realized that all the processed food I was eating was feeding my fibroids. I have learned to love raw and cooked vegan foods. I realized that when I eat well, my creativity goes through the roof. Now I create raw and cooked vegan recipes all the time. Some months back I shared a raw collard green recipe with another sister who was very obese. She said she rarely ate salads and loved bologna. She loved my collard green recipe so much that she has made that recipe for just about every family gathering since! She told me that most of her family members are obese and that collard dish I shared with her opened the door to conversations about how tasty healthy food can be. This morning, two weeks exactly befor Kujichagulia, after my morning meditation, I made a commitment to myself to stop ‘eating myself to death and start eating to live’ so that I can fulfil my personal mission of helping others in my community. I work as a recovery leader, re-entry advocate, and fatherhood initiative case manager. I am also a single mother whose son is afraid will not live to see her grandkids. Six years ago I quit smoking (along with some other unhealthy habits) and today I woke up with the acceptance that I am obese. I was NOT created to live this way! In my soul I know that I was “born to make manifest the glory of God” and cannot do that unless I live. So, today I began eating things that are grown, not raised or caught. I had oatmeal and tea for breakfast. For lunch I went to a ‘soul food’ cafe and had cabbage, lima beans and cornbread. I am purchasing your book so I can learn how to eat healthy, flavorful and well. I accept that everything does not need sugar added or to be fried. I am looking forward to your recipes and a new way to eat. Thank you for all you have done to bring this issue to light. Bless you! I am inspired by the Kwanzaa principle Kugichagulia to eat healthy. The power of life and death is in our own hands with the food choices that we make. When we decide to empower ourselves through healthier food choices- baking or grilling instead of frying; incorporating more fresh fruits and vegetables into our diets, giving our kids apples instead of chips for snacks; drinking water, juice, tea instead of pop/soda; We determine our future by reducing our risk of heart disease, diabetes, obesity, and other medical conditions that kill our people and impair our quality of life. I do not celebrate Kwanzaa, however, my family loves to learn about all cultures and their celebrations. The Kwanzaa principle that would apply to us is Cooperative Economics. We do this by participating in a organic CSA and build our meals around the fresh produce delivered weekly. I would say Kuumba (koo-OOM-bah) Creativity, Making the community better and more beautiful because creativity is also the key in making healthy dishes from healthy ingredients. The principle that helps me to eat healthy is Ujamaa (Cooperative Economics, Supporting businesses that care about the community). Every Wednesday and/or Saturday, I visit my local farmer’s market to gather sustenance for the week. I love to create dishes, and using the beautiful and fresh bounty from my neighbors makes it an especially satisfying experience. I freeze the scraps and bring them with me to turn in for composting. I feel that this completes the circle and it is an extra little help to the farmers who work so hard to bring this good food to me. So glad Mr. Terry is coming out with a new book! Vegan Soul Kitchen is a wonder – can’t wait to see what else he has in store! This entry was posted on December 6, 2011 by Kwanzaa Culinarians in 2011, contest, Interview, Kujichagulia, Personal Story, publishing and tagged book, Bryant Terry, contest, giveaways, Miso and Maple-Candied Sweet Potatoes, Molasses, The Inspired Vegan.